* MARFORD HILL COTTAGE * OOZING CHARACTER & CHARM * DELIGHTFUL GARDENS * A Grade II Listed two/three bedroom detached cottage forming part of a conservation area located along Marford Hill and understood to have been built during the early part of the 19th century. The accommodation, which retains a wealth of character features to include exposed beams and gothic style windows, briefly comprises: entrance vestibule with arch to entrance hall, dining room/reception room with open fireplace, living room with bay window and fitted window seat, kitchen, ground floor bedroom, first floor bedroom with bathroom and dressing room/bedroom 3. The property benefits from gas fired central heating. The cottage is set within mature gardens with a gated gravelled driveway, double garage and log store. If you are looking for a period property, with potential to improve, then we would strongly urge you to view. (This property is for sale by North West Property Auction powered by iamsold Ltd). to a minimum amount of £6,000.00 including VAT. The buyer will be required to sign an Acknowledgement of Reservation form to confirm acceptance of terms prior to solicitors being instructed. Copies of the Reservation form and all terms and conditions can be found in the Legal Pack which can be downloaded for free from the auction section of our website or requested from our Auction Department. Marford is situated approximately 5 miles to the north east of Wrexham on the former main Wrexham to Chester Road. The village developed around Marford Hill which rises upwards marking the junction between the low-lying Cheshire Plain and the Welsh hills. The Cheshire Plain provides an important backdrop to the village extending for many miles to the east and providing views of distant landmarks including Eaton Hall and the River Dee. On the far horizon, interrupting the skyline are the Bickerton Hills. The Conservation Area centres on the unique historic core of the village which clings to the lower woodland slopes of Marford Hill. The attractive picturesque cottage orne design of many of the buildings gives the village a distinct identity. There are two public houses in Marford, one at the bottom of the Marford hill The Trevor Arms, and the other at the top, The Red Lion. There is one shop, the co-op which opened in June 2016, adjacent to The Red Lion. The village also has a disused quarry which was designated a SSSI in 1989 and was purchased in 1990 by the North Wales Wildlife Trust as a nature reserve. Road communications are excellent, being half a mile from the A483 Wrexham by-pass which connects to the Chester Southerly by-pass facilitating access to the national motorway network. The Wrexham Industrial Estate, Chester Business Park and Deeside Industrial Park are all within daily commuting distance, as are the larger centres of Liverpool and Manchester which are served by international airports. Rossett - 1 mile, Gresford 1.5 miles, Wrexham - 5 miles, Wreham industrial Estate 5 miles, Chester - 9 miles, Mold - 11 miles, , Deeside Industrial Park - 15 miles, Chirk - 15 miles, Llangollen - 17 miles, Ruthin - 20 miles, Oswestry - 20 miles, Liverpool - 30 miles, Warrington - 30 miles, Liverpool Airport - 32 miles, Manchester Airport - 41 miles, Manchester - 49 miles and Anglesey - 79 miles. (Source RAC Route Planner - all distances are approximate). The Cottage is a Grade II listed property built in the distinctive Trevalyn Estate style. The building is set behind a traditional sandstone wall which is enhanced by hedging growing adjacent and above. The Cottage originally fronted the old coach road which ran parallel to the building to the west and was historically used as a toll house and village shop. The side elevation facing down Marford Hill has a single storey apsidal bay with multi-paned cast iron window with ogee arched head flanked by small gothic arched lights. Facing Marford Hill to the east are two single storey apsidal extensions with a variety of gothic and ogee arched windows. Wooden panelled arched entrance door with leaded window, two arched leaded side windows and quarry tiled floor. Arch opening to Entrance Hall. Single radiator, beamed ceiling, hanging for cloaks and arched leaded window overlooking the garden. Wooden panelled door with leaded glazed inserts to Bedroom Two and wooden panelled door to Dining Room/Reception Room. Feature brick fireplace and hearth with open grate, beamed ceiling, two built-in oak storage cupboards understood to have been reclaimed from nearby Hoseley Hall, wood block parquet flooring, ceiling light point, beautiful Gothic style window overlooking the garden, two arched windows overlooking Marford Hill, fitted shelving and serving hatch to kitchen. Door to Kitchen and wooden panelled door with leaded glazed inserts to the Living Room. Feature bay with five arched leaded windows and fitted window seat, arched leaded window to the side, ceiling light point, column style radiator with thermostat, wood block parquet flooring, recessed display shelving and chimney breast with decorative stone lined recess. Fitted with a range of base and wall level units with work tops. Inset single bowl sink unit with separate drainer and mixer tap. Wall tiling to work surface areas, space for gas cooker, tiled floor, double radiator, space for American style fridge freezer, plumbing and space for washing machine, freestanding Potterton Kingfisher Mf gas fired central heating boiler, feature vaulted beamed ceiling, electrical consumer board, electric meter, three windows and stable type door to outside. With four arched windows, beamed ceiling, ceiling light point, double radiator, vanity unit with inset wash hand basin, tiled splash-back and storage cupboard beneath, wood block parquet flooring and built-in storage cupboard. With windows overlooking Marford Hill and the garden, feature pitched ceilings with ceiling light point, double radiator and fitted chest of drawers. Doors to the Dressing Room/Bedroom Three and Bathroom. Gothic style leaded window, single radiator, smoke alarm, wall light point and two built-in storage cupboards with sliding doors. Coloured suite comprising: enamelled bath with tiled side panel and electric shower over; pedestal wash hand basin; and low level WC. Gothic style leaded window, tiled walls, ceiling light point, single radiator, exposed wooden floorboards, built-in storage cupboard, eaves storage cupboard with light point housing the hot water cylinder and additional eaves storage cupboard with light point. The Cottage occupies a good sized plot along Marford Hill and is a approached via a gated gravelled driveway. There are lawned gardens to the side and rear with well stocked borders, sandstone retaining walls, mature shrubs and trees, and an ornamental pond with rockery. Outside light and external gas meter cupboard. Aluminium framed greenhouse. Outside WC. With wooden entrance doors, power and fluorescent strip lighting. To the side of the garage there is a log store measuring 18'8" x 3'11. * Council Tax Band F - Wrexham County Borough Council. From Chester proceed over the Grosvenor Bridge to the Overleigh roundabout and take the second exit onto the Wrexham Road, passing the Chester Business Park on the left. At the roundabout with the A55 Expressway continue straight across onto a stretch of dual carriageway which leads into the A483 Wrexham by-pass. Then take the first exit signposted Rossett and at the top of the slip road turn left. Follow the road down to the mini roundabout and turn right and proceed up Marford Hill. The property will then be found, shortly after the Trevor Arms public house, on the right hand side. 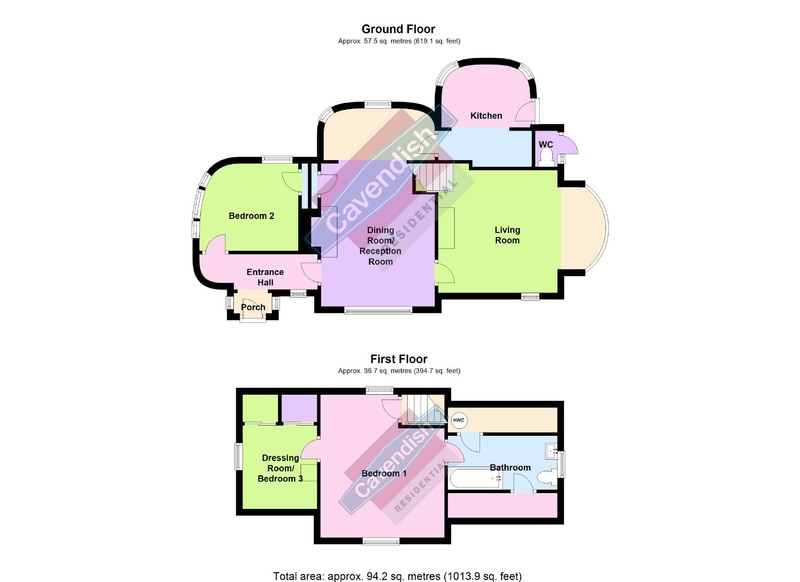 If you are considering purchasing this property as a buy to let investment, our award winning lettings and property management department offer a preferential rate to anyone who purchases a property through Cavendish and lets with Cavendish. For more information contact Lettings Manager, David Adams on 01244 401440/david.adams@cavendishrentals.co.uk.